Orange County Mayor Teresa Jacobs was a panelist at the West Orange Chamber of Commerce’s (WOCC) annual Mayoral Update Luncheon on May 23. The event brought together community leaders including Town of Oakland Mayor Kathy Stark, City of Ocoee Mayor Rusty Johnson, Town of Windermere Mayor Gary Bruhn and City of Winter Garden Mayor John Rees for a discussion on updates in the West Orange community. The event, facilitated by Fred Kittinger, University of Central Florida Associate Vice President of University Relations and Director of State and Local Government Affairs, is part of the chamber’s signature luncheon series. The Mayoral Update Luncheon allows residents to get to know their local leaders, learn about updates and policies in their region and participate in conversations impacting business owners and residents. During her remarks, Mayor Jacobs spoke to some of the most challenging issues facing the community today. In 2015, Mayor Jacobs convened the Orange County Heroin Task Force in response to the national opioid crisis. Building on a commitment to public safety, Orange County also took the lead on youth mental health by convening the Youth Mental Health Task Force in 2013, which included families and experts from the education, treatment and law enforcement sectors. Additionally, Mayor Jacobs shared her vision and commitment to tackling the national issue of affordable housing on a local level. The result of Orange County’s Affordable Housing Executive Summary and Recommendations will serve as a blueprint for Central Florida and will focus on a range of resources to help low-income families and individuals succeed. The panel also discussed Orange County’s important recent public safety step that closes the “gun show loophole” through the unanimous passage of a County ordinance that requires criminal background checks and a three-day waiting period for anyone purchasing a firearm at a gun show, flea market or firearms exhibit — a requirement that otherwise only applied if the firearm was from a licensed gun dealer. The West Orange Chamber of Commerce is an organization focused on building partnerships, strong businesses and a commitment to the community. The chamber is an advocate to more than 1100 members businesses, facilitating businesses opportunities in Central Florida. 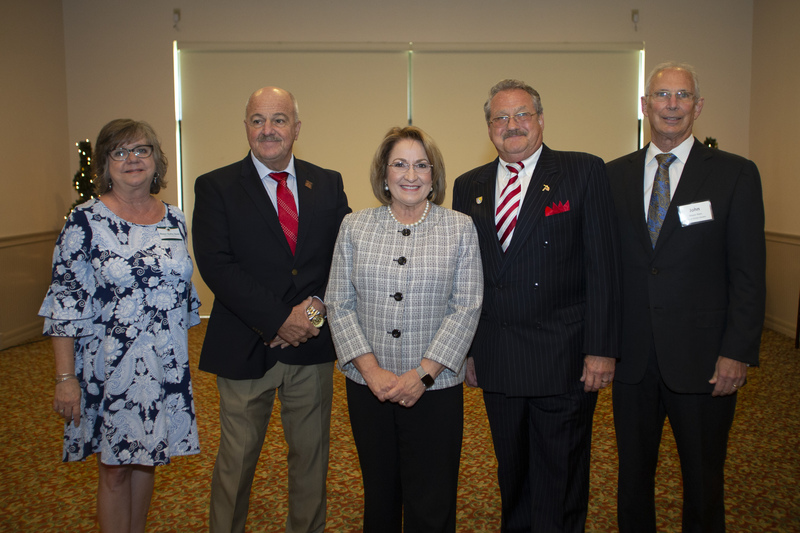 Photo Caption: L-R: Town of Oakland Mayor Kathy Stark, City of Ocoee Mayor Rusty Johnson, Orange County Mayor Teresa Jacobs, Town of Windermere Mayor Gary Bruhn and City of Winter Garden Mayor John Rees gather for the West Orange Chamber of Commerce Annual Mayoral Update Luncheon.